This undated photo provided by the National Park Service shows a human print inside a large sloth track at the White Sands National Monument in New Mexico. 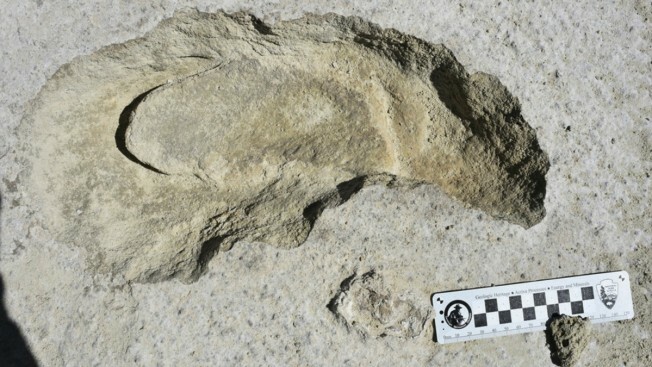 Researchers studying a trail of fossilized footprints on the New Mexico salt flat have determined the tracks tell the story of a group of Ice Age hunters stalking a giant sloth. The team studying the fossil prints detailed its findings in the latest edition of the journal Science Advances, the Las Cruces Sun-News reports. The publication has drawn attention to White Sands — home to the world's largest field of white gypsum sand dunes — as members of New Mexico's congressional delegation push to raise the monument's profile by turning it into a national park. It's unclear why ancient humans would have stalked the sloth, said team member Matthew Bennett, a professor of environmental and geographical sciences at Bournemouth University in England. The creature — at 7 to 8 feet (2 meters) tall with long arms and sharp claws — had a distinct advantage in close-quarter encounters.